There are many freebies being offered online from well-known companies, and some not so well-known companies too. This is a guide on how to make sure you’re keeping your personal data safe when applying for them – are they genuine freebies? Some scammers may set up a freebie website simply to harvest your personal details. But with a little knowledge and a bit of work, you can check out the site and make sure it is a legitimate offer. 1. Is it a brand you know? If it’s a big named brand offering a freebie on their main website, then you don’t really need to worry. But if you’ve never heard of the brand, do a little research and see what people have written about them in the past. 2. Does the site look professional? If it’s a site you’ve never heard of before, navigate around and make sure all the links are working. Is the home page blank? Avoid them. Are there false details on the contact us page? Avoid them. Is the site full of typos and grammatical errors? Avoid them. Just use a bit of common sense in deciding whether or not it is a legitimate offer. 3. Is the Whois data reliable? registered to a false email address, or if the details look suspicious, then these are some warning flags to watch out for. However, some companies may set up new domains for a special promotion and the Whois data might be very new. You can check this by going to the mother site and making sure that the new domain is linked to directly from there – giving the new site a true link and reason to exist. 4. Did you use a unique password? When signing up to a freebie, mailing list, or special offer, it is always recommended not to use the same password as you do at many other sites. If the data is compromised, they will simply be able to go to other sites where you use the same email address and password combination. They can then log in to your accounts elsewhere, causing potential issues with data theft or credit card theft. Use unique passwords for each and every site you sign up to, ideally managed by a password manager. 5. Did you Google search for some history? It’s always useful to Google search for the company name or “received X freebie” and you can see if people out there have actually had success with the offer. In many cases, you’ll see reports on forums telling others that it’s a scam or a data collection site, warning people not to use it. Alternatively, you may see reports that people have received the item, and you have a reason to trust that it could be a true freebie. But look closely and make sure those reports are not seeded – see that the comments are from established users of the site with high post counts, and not a brand new member on their very first post. 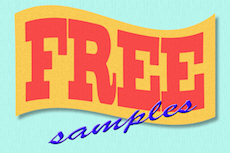 If a freebie sounds too good to be true, it probably isn’t real. Spend a few minutes checking out the website using the above tools and tips, and you can keep your personal information safe from the scammers. It is wise to always use caution when handing over your personal information online. So many sites are just thrown together to capture your data. Even if it isn’t a site run by scammers it could be a low-quality lead capture site which will sell your email address and bombard it with all sorts of offers.